Climate change is thought to have major effects on groundwater resources. There is however a limited knowledge of the impacts of past climate changes such as warm or glacial periods on groundwater although marine or glacial fluids may have circulated in basements during these periods. Geochemical investigations of groundwater at shallow depth (80–400 m) in the Armorican basement (western France) revealed three major phases of evolution: (1) Mio-Pliocene transgressions led to marine water introduction in the whole rock porosity through density and then diffusion processes, (2) intensive and rapid recharge after the glacial maximum down to several hundred meters depths, (3) a present-day regime of groundwater circulation limited to shallow depth. This work identifies important constraints regarding the mechanisms responsible for both marine and glacial fluid migrations and their preservation within a basement. It defines the first clear time scales of these processes and thus provides a unique case for understanding the effects of climate changes on hydrogeology in basements. 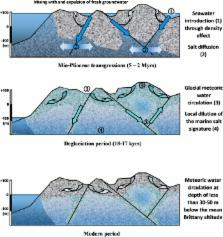 It reveals that glacial water is supplied in significant amounts to deep aquifers even in permafrosted zones. It also emphasizes the vulnerability of modern groundwater hydrosystems to climate change as groundwater active aquifers is restricted to shallow depths. Cenozoic continental climatic evolution of Central Europe. Continental climate evolution of Central Europe has been reconstructed quantitatively for the last 45 million years providing inferred data on mean annual temperature and precipitation, and winter and summer temperatures. Although some regional effects occur, the European Cenozoic continental climate record correlates well with the global oxygen isotope record from marine environments. During the last 45 million years, continental cooling is especially pronounced for inferred winter temperatures but hardly observable from summer temperatures. Correspondingly, Cenozoic cooling in Central Europe is directly associated with an increase of seasonality. In contrast, inferred Cenozoic mean annual precipitation remained relatively stable, indicating the importance of latent heat transport throughout the Cenozoic. Moreover, our data support the concept that changes in atmospheric CO2 concentrations, although linked to climate changes, were not the major driving force of Cenozoic cooling. A continuous seawater sulfate sulfur isotope curve for the Cenozoic with a resolution of approximately 1 million years was generated using marine barite. The sulfur isotopic composition decreased from 19 to 17 per mil between 65 and 55 million years ago, increased abruptly from 17 to 22 per mil between 55 and 45 million years ago, remained nearly constant from 35 to approximately 2 million years ago, and has decreased by 0.8 per mil during the past 2 million years. A comparison between seawater sulfate and marine carbonate carbon isotope records reveals no clear systematic coupling between the sulfur and carbon cycles over one to several millions of years, indicating that changes in the burial rate of pyrite sulfur and organic carbon did not singularly control the atmospheric oxygen content over short time intervals in the Cenozoic. This finding has implications for the modeling of controls on atmospheric oxygen concentration. Effects of human activities and urbanization on groundwater environments: an example from the aquifer system of Tokyo and the surrounding area. Temporal variability of groundwater chemistry in shallow and deep aquifers of Araihazar, Bangladesh.